A super hybrid with rigid stems and very large trumpet shaped green, brown throated flowers. These have now become too big to pack safely. They will be available again through this website in the autumn or by pre-ordering to take to one of our plant fairs which we attend. 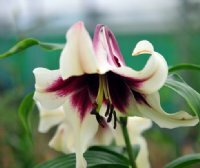 An exceptional hybrid of lily which always catches attention at flower shows being very similar to nepalense but so much easier to grow. Thick, strong growing and very rigid stems carrying broad lanceolate deep green foliage, the stems occasionally purple. The flowers are held in on the stem tips and can be up to 6 or so in number. Each flower is slightly pendulous and up to 16 cms wide with a fine scent. Colour is greenish with almost half of the flower from the throat outwards being a chocolatey-red colour. It requires a position in the garden which is moderately moist and fertile through the summer months when its in growth but it must be well drained through winter.